From pretty pink gowns to regal capes and slinky slip dresses, we’ve got all the hottest wedding dress trends you need to know. Not into veils? A full-length bridal cape or shorter capelet is the perfect alternative: It still adds dimension to your gown, but feels modern. Plus, this trend is an easy way to pull off a mid-wedding outfit change. Wear a cape or capelet for a more formal feel during your ceremony, then whisk it away to reveal a different look for your reception. Put the emphasis on your face and show off your shoulders in a dress with an elegant halter neckline. This more modest style also works for a range of body types, as it flatters the upper body and offers additional support for bustier brides. Perfect for an evening affair under the stars, this trend is daring but sophisticated. Pro tip: If you’re rocking a gown with metallic fabric or embellishments, keep your accessories minimal and let your glitzy frock do all the talking. 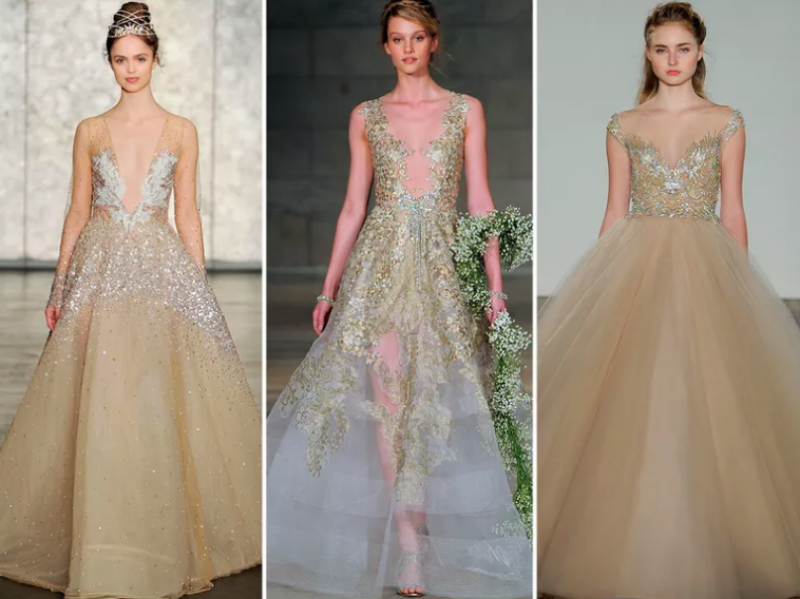 It’s official: The millennial pink trend has taken over bridal fashion. This versatile “it” hue appeared in almost every collection, running the gamut from splashy deep pink embroideries to more ethereal shades of blush and mauve. We’ve said it before, but we love the wedding pant style. Because whether you’re eloping, looking for a chic bridal shower ensemble, or just aren’t into dresses, pants have you covered (No pun intended). Jumpsuits and pantsuits are comfortable, figure flattering and totally of the moment. 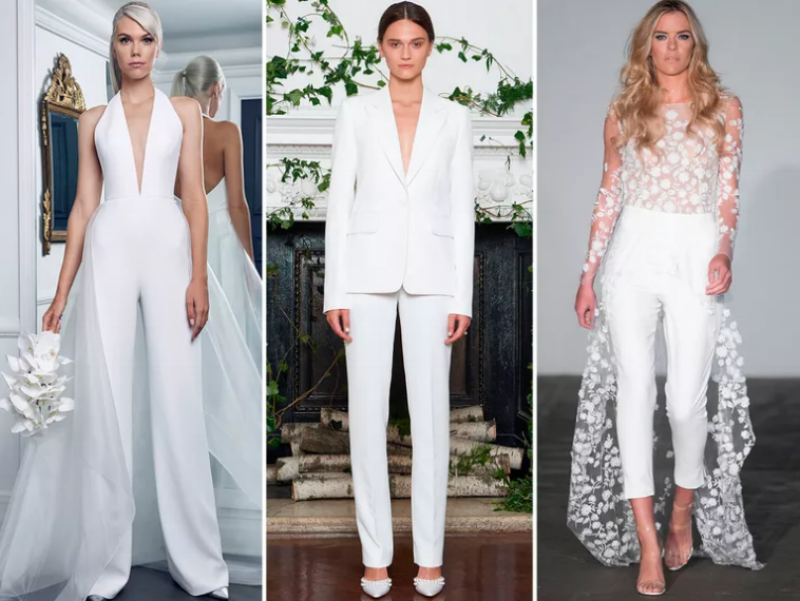 A sleek jumpsuit with a detachable train is dressy enough for a modern ceremony, while a tailored white pantsuit is perfect for city hall nuptials. A high collar gives off seriously high-fashion vibes. Scalloped lace will give you a regal feel, or go for a super-modern style with a sleek one made of tulle or satin. Pro tip: Statement earrings and a windswept up-do perfectly complement this buttoned-up trend. Lover of ’90s style, rejoice! The slinky, curve-skimming slip dress is back. Go for timeless glamour with a simple, heavy crepe style, or go boho with a lace embellished bodice. Either way, this silhouette is effortlessly sophisticated.